Empathy In Marketing: The Secret To Better Relationships! The current buzzword in marketing might seem to change more often than the average person changes their socks, but one idea that appears to have more staying power than most is the concept of empathy in marketing. We should all (hopefully!) be familiar with empathy in our everyday lives, but the application of the concept to marketing can be slightly less clear, particularly when communicating with millions of users via multiple different platforms. There are two elements to empathy: understanding someone else’s feelings, and sharing their feelings. That may all sound very warm and fuzzy, but for some time now smart marketers have realised that connecting with users in this way is the key to converting far more users into revenue-generating customers. That’s because, as a rule, people don’t particularly like being sold to: they like being helped. Create campaigns that deliver value to users and approach them in the way they’d like to be approached, and you’ll find the improved customer experience this delivers encourages engagement, loyalty, and therefore ROI. So what’s the best way to make this happen? One approach is hand-written cards, but you'll find out pretty quickly that that doesn’t scale. More realistically, developments in marketing tech have the potential to bring a little more empathy into your marketing. That might seem paradoxical - how can something that is, by definition, not human, enable us to connect more closely with users and make our interactions more - well, human? It’s true that there are plenty of examples of technology being used to deliver the opposite effect. 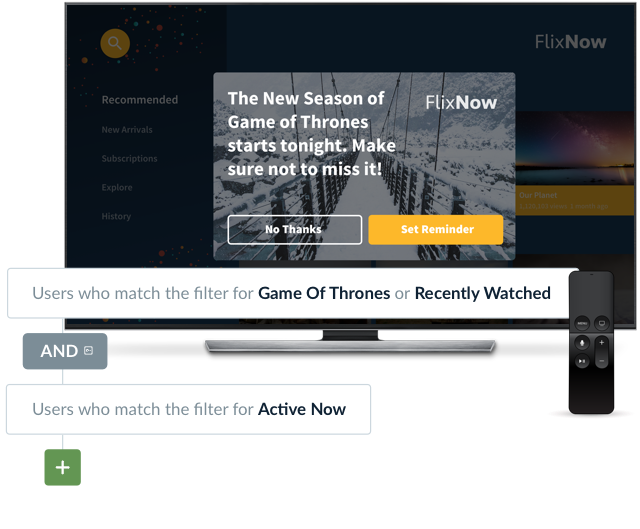 Think of the generic home screen that’s shown when opening a new app, even if you arrived there after clicking on a specific ad, or that push notification you get at 3.27am every day for two weeks, letting you know about a TV show that you’ve never watched. However, one of the major advantages of digital marketing is that it also allows us to know more about users than ever before. Assuming here that you want to stay firmly in the category of ‘helpful and successful’, here are some pointers for introducing empathy into your marketing, and how tech can help. In the world of digital, understanding means data. Apps and other digital platforms are in the privileged position of having access to lots of data: previous interactions, time spent in the app, current balance, and almost anything else you can think of. Getting to understand what your users are likely to want means looking not just at major transactions but at any behaviour or actions that might be informative, as well as information about their environment. Remember the classic example here: even with all the behavioural targeting possible, nobody wants an umbrella on a sunny day, but everyone wants one when it’s raining. It isn’t enough to just gather this data either - what’s more important is that these digital platforms have the ability to turn it into actionable insights. For example, knowing that one user opens up a news app at 6pm every weekday to read articles is more than just an interesting fact - it’s an opportunity to send them an in-app message at 6.20pm (or at an appropriate moment as close to that time as possible) letting them know that they could access even more articles by subscribing. Understanding your users means knowing that they look for, what they like, how and when they prefer to interact: and then putting this into practise in your planning. So, you know your users pretty well, and how you can interact with them. Empathy in marketing means not just sending any interaction that fits with these insights, but planning campaigns that they actually want to see. Putting yourself in your users’ shoes means that you’re likely to be more effective at establishing long-lasting positive customer relationships, rather than just getting noticed. To return to our example, an empathetic marketing strategy wouldn’t involve delivering a generic ‘Subscribe now!’ message every Thursday at 6.20pm to our hypothetical user above, just because we know they’ll be in the app. Any good marketer will have learned that more isn’t always better - no user wants to be bombarded, and in fact they’re likely to disappear if they are. Likewise, no one wants to be sent a generic campaign that makes them feel like just another number in the app’s database, or one that wastes their time. This is the time to be hard on yourself - it’s worth stopping and asking the question: ‘am I sending this because I think it’s genuinely helpful, or because I want to?’ or, even, ‘because I might as well?’. Instead, take time to craft a personalized message that targets the kinds of articles they most commonly read is more likely to be seen as a useful suggestion rather than a sales push, particularly if it’s sent as they’re browsing for their next article, rather than halfway through reading one. Approach campaigns from a user’s perspective and it’s easy to see that the most effective campaigns are the ones that rely on fewer, more targeted communications. Empathy means knowing how and when to interact. That happens when we get to know users by interpreting accumulated data and putting it into action, as well as approaching campaign creation as a human and an app user yourself. Creating campaigns that appeal to real people is the most efficient and sustainable way to drive revenue, customer satisfaction and growth.